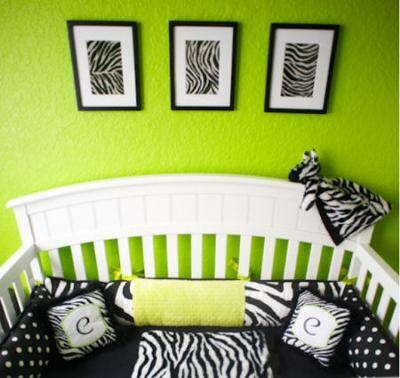 Carly's zebra print nursery bedding is bright and beautiful with the lime green wall paint color. Carly's lime green zebra nursery may seem to be a little bright to some people but to me; that's the beautiful thing about owning our own home; we can do whatever we want and not worry about a fussy landlord or about pleasing anyone but ourselves. Jen, author of the blog "According to Jen" says that they took some flack about the color they painted their baby girl's nursery but she didn't let other people's opinions bother her. Jen had a vision of what she wanted the nursery to be and when all was said and done even the most vocal of her critics had to admit that the room turned out to be really, really cute. Jen chose to paint the nursery walls in a bright, lime green color by Behr that was bought at Home Depot called Green Crush (S-G-410). Bless her for providing this information on the front end since we were sure have been bombarded with comments asking what the name and brand of the paint color is! The crib has been discontinued but just in case someone likes it and wants to look for a used one; it's the white Charleston Convertible Crib manufactured by Graco. Jen made the zebra artwork on the wall behind Carly's crib herself using black frames that came already matted from Walmart and zebra print fabric that she found at Hobby Lobby. It was once a picture of an entire zebra. As much as I like zebras; I like this idea better. 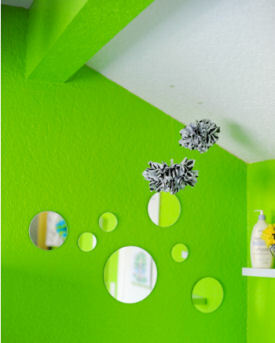 The reasoning behind the lime green, black and white nursery color scheme, as attractive as it is, was chosen to stimulate Carly's visual development with high contrasts. The vibrant, modern style of the space was a welcome byproduct of the process. Another feature to catch Carly's eye are the nursery ceiling decorations hung over the baby's crib. They are made of tissue paper in black and white zebra print and bright colors that were purchased at Hobby Lobby. 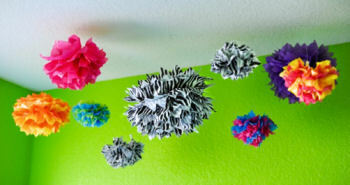 If you haven't learned how to make tissue paper pom poms yet, you really should. 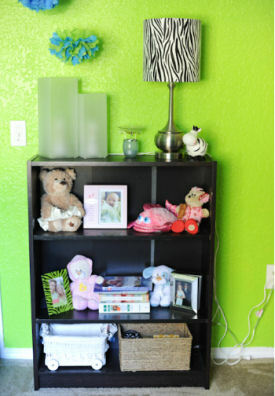 I'm sure after seeing how cool they look in Carly's lime green zebra nursery that you will put that on your "to-do" list! Right? The black bookshelf came from Ikea. The lamp with the zebra print lampshade and the bobble head zebra coin bank came from Home Goods. The arrangement of mirrors on the wall expand the space and add light. The mirrors used to create the wall arrangement over the changing table as well as the white, floating wall shelves came from Target. 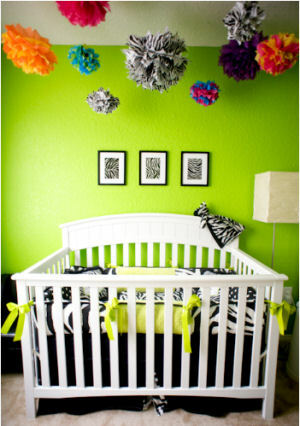 That concludes our tour of Carly's lime green zebra nursery. If you have questions about any of the craft projects that you see on Unique Baby Gear Ideas in the pictures or would like to see more of her nursery pictures, just run over to According to Jen and leave a comment with your question. I love Carly's nursery and will do something similar only bolder! I am going to add purple to the mix to see how it looks with green and really rev up the energy in my baby girl's nursery. Best lime green paint color. I LOVE bright, bold colors and the paint color that you used for your baby girl's room is just perfect. I know that computer monitors display colors differently and I wonder if you could tell me if the color has any blue undertones in person or if it would blend with shades of blue? This room is so cute! Where did you find the crib bedding? I LOVE this nursery!!! This is so CUTE and bright! I love it!